The Santeria religion is an amalgam of Catholicism and the Lucumi religion of the African Yoruba tribes. When the slaves brought to Cuba were denied religious freedom, they disguised their gods in Catholic garb. 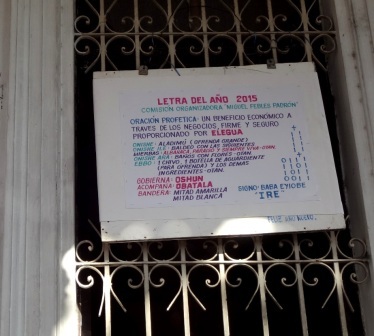 Today the words saint and orisha can be interchangeable in Cuba. There are about 400 gods in total, but only about 20 are honored in daily life. Many homes in Havana have a spirit altar with a statue of a santeria god, alongside a glass of water and other items meant to appease the spirits of the dead. 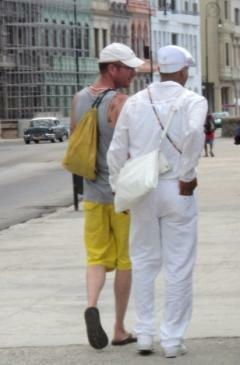 When walking in Havana’s streets, you will come across people clad entirely in white. These people are in their first year of Santeria instruction. The gods are believed to have magical powers and so are consulted for help. It’s necessary to pay a babalawo (priest) to act as a go-between in order to interpret their commands. You will see people wearing colorful beads that relate to their ruling orisha; for example, those for Chango are red and white. You can buy generic beads in a Havana shop but a serious adherent of santeria will have a santero use divination to determine the bead pattern and activate the power of the orisha. Each saint has his or her own costume and dance, as well as an altar, such as the ceiba tree in Havana’s Plaza de Armas where offerings of food and coins are placed. At other altars, small caged birds and animals await the knife.